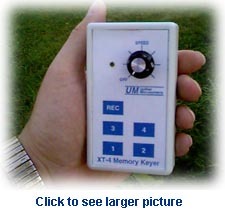 The XT-4 is a battery powered CW memory keyer. 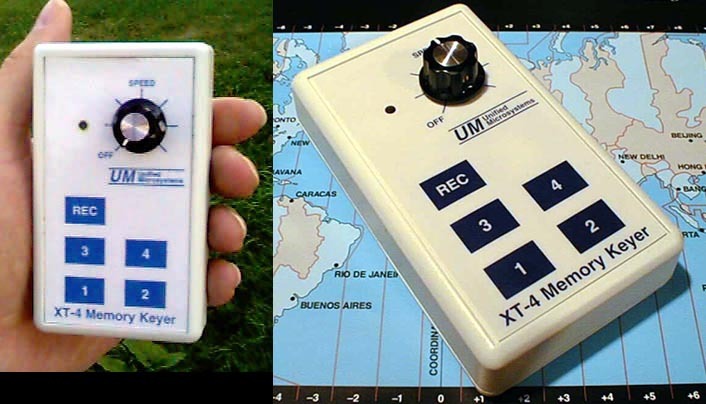 The small size and weight makes it perfect for Field Day, DXpeditions, County Hunting mobile operations, VHF rover and portable or vacation operations. Its clean design will also look great in your shack. The XT-4 is fully iambic with self-completing characters. The CW speed range is 8-45 WPM. Each of the 4 memories can hold approximately 110 Morse characters. The memory locations are non-volatile, saving your programmed information even when the power is removed. Program them with your CQ, call sign, and contest exchanges. Between contests program in QSO information like your name, QTH, and rig information. Programming is simple! Just press the record and message buttons and start sending! The XT-4 is designed for long battery life. A 9V alkaline battery will give several hundred hours of heavy use. The power save function automatically puts the XT-4 into an even more power stingy mode after 30 minutes of inactivity in case you forget to turn it off. Pressing the paddle or a memory button instantly brings it back to normal operation. The paddle reverse function lets you reverse the dit and dah keys without re-wiring the cable. Great for Field Day and other multi-operator activities! The XT-4 is designed to work with modern solid state rigs with positive keying. Pre-assembled cables available -- see below. Size: 2.5" X 1.1" X 4.5"
The XT-4 CW Keyer is available for $69.95. See Below to Order! Includes cables to the paddle and transmitter. Paddle cable has connector to the XT-4 on one end and stripped and tinned wires on the other. The KC-4 Cable Set has the transmitter cable terminated with a 1/4" mono phone plug. The KC-8 Cable Set has the transmitter cable terminated with a 1/8" plug. Contact Unified Microsystems for other connector types. The KC-4 and KC-8 Cable Sets are available for $9.95 each. See Below to Order! The XT-4Beacon is the perfect start for your VHF/UHF beacon or other project requiring a CW IDer. Just plug in your keyer paddle and program your ID message. Its long, non-volatile memory space allows messages up to 90 seconds at 25 WPM. Click here for more details.